Beneficiaries of the Agricultural Media Resources and Extension Centre (AMREC), Federal University of Agriculture, Abeokuta (FUNAAB) Farmers’ Loans Scheme (AFFLS), have expressed appreciation to the University and AMREC for establishing the loan scheme for farmers. 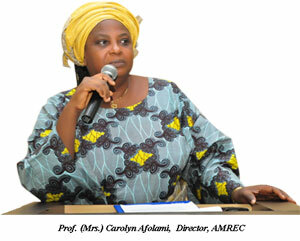 In a communiqué issued at the end of the AFFLS Forum, which was held to assess the performance of both the loan delivery services and administration of the scheme within the last one year of its existence, the Director of AMREC, Professor Carolyn Afolami, said the farmers expressed their gratitude to the University, as they also requested that the micro-credit scheme be extended to medium and large scale entrepreneurs, while farmers from outside the University’s catchment extension villages should also be included in the scheme. It further stated that apart from cash, the farmers had signified their interest in accessing the loan through the provision of improved farm inputs and solicited that the University should increase the volume of loans disbursed to farmers, in view of the changing economic conditions, as well as the increase in the prices of agricultural inputs and the cost of production. The Director of AMREC, however, enjoined the participants to form themselves into groups, to access loans and other inputs, while assuring them of the continued support of the University, through AMREC.